Whether your group has been coming to NaCoMe for years or it's your first time, we can help you put a schedule of activities together that will keep your group engaged and excited. Activities at NaCoMe range from the camp classics (like archery or canoeing or swimming) to the extreme (ziplines, rock walls, Giant Swings, anyone?). We believe that the activities aren't the reason groups come to NaCoMe, but they play an important role in the overall experience. So let us help improve your retreat with activities; we can collaborate to make your vision a reality, regardless of your adrenaline tolerance or your budget. The Creek: search for crawdads in our cool creek or simply sit back and relax. Horseshoes: Our side-by-side horseshoe pits foster community and friendly competition. Get athletic: Our basketball, volleyball and 4-square courts are a great way to get your heart pumping! Gaga: Feel the thrill of this unique version of dodgeball in our custom octagonal pit. 9 Square In The Air: Traditional 4-Square, expanded to 9 squares, then turned upside down. Fast paced and addictive! Human Foosball: A life sized version of the table-top classic. Hiking: We've got over 600 acres that can satisfy your appetite for exploration. Disc Golf: Our 9-hole course spans our beautiful main camp area. Bring your own discs or borrow ours! Rec Field: Up for a game of flag football? Our field is big enough to accommodate any group. Want to up the adventure level? In addition horseshoes, disc golf, and our famous creek, NaCoMe also offers a variety of more adventurous programming options. We do our best to work with groups to maximize the opportunities while minimizing cost. During the planning stages of your retreat, you'll have the opportunity to choose any of the following activities. We'll work with you to maximize the opportunities for your group, while minimizing cost. Consult the pricing guide here, and give us a call to talk about the options for your group. Please request these activities at least three weeks prior to your scheduled retreat. Situated at the far end of main camp, we’ve dammed the creek to form a natural body of water for swimming and playing. Lifeguards are mandatory and are a function of the total number of people swimming. Total cost is calculated by the number of lifeguards your group requires. Towering at over 50 feet, our giant swing offers a rush of adrenaline. Have your group pull you up to the top or just as high (or low) as you’d like, pull the cord and feel the wind on your face as you swing down and back to the tops of the trees. Get your heart pumping and palms sweating as you climb more than 30 feet on a single pole, then stand on top with nothing to hold on to. If that wasn't enough, the next task is to leap out to ring the bell, relying on the rope and your harness to catch you. In addition to our trained staff, you're guaranteed to need faith in your group- they're the ones holding the rope! 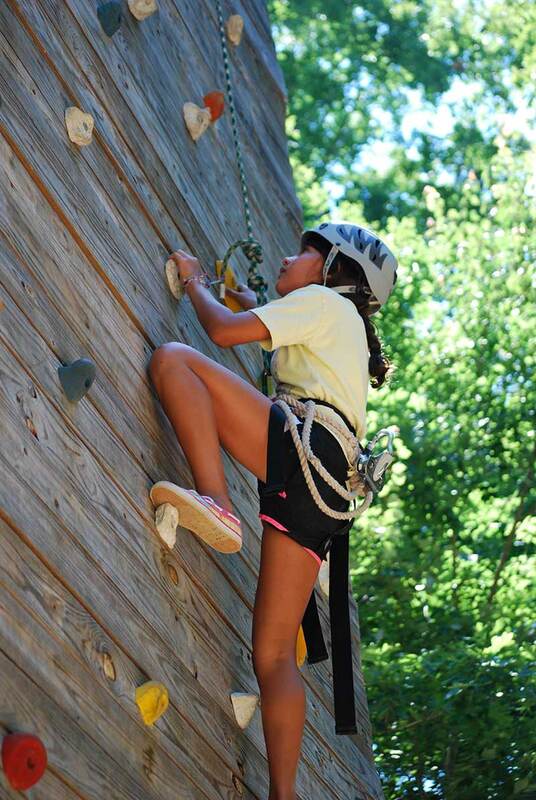 Whether you’re a first-time climber or an experienced mountaineer, our wall is perfect for you! Our highly-trained staff will cover safety, climbing basics, and provide the equipment. The climbing wall and zipline are connected and can be ran together. 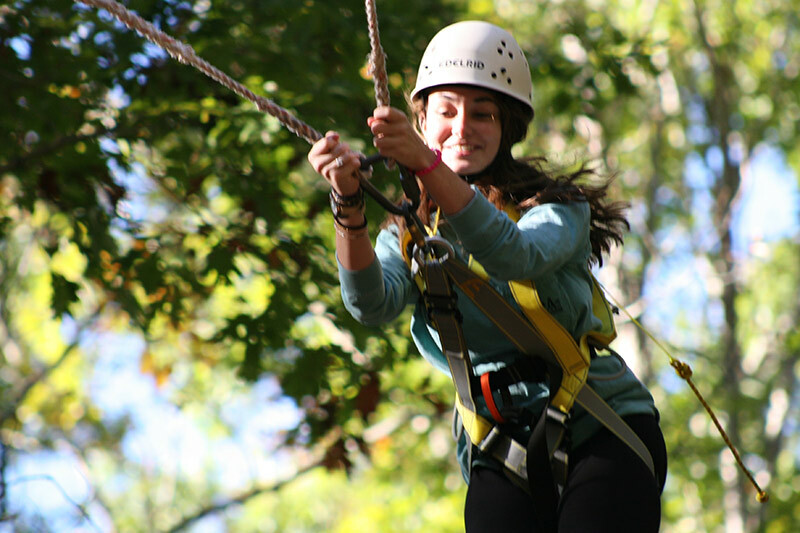 Feel the wind rush by as you fly down our zipline. Towering nearly 50 feet off the ground, our zipline isn’t for the faint of heart and has been the highlight of countless retreats. Zip on to the climbing wall and off for this amazing experience. Just a short hike up a tree-lined trail sits our pristine lake. We have canoes and kayaks with all the paddles and lifejackets your group needs. After a quick course in basic canoe skills, enjoy racing, exploring, or just relaxing on the water. 1-2 NaCoMe staff are required to serve as lifeguards. A must have for summer camp and retreats! Great for fostering growth and developing community. We’ll facilitate get-to-know-you games, team initiatives, and challenges designed to elicit reflection and awareness. Multiple groups can use the course simultaneously. Unleash your inner Robin Hood, David, or Katniss! A NaCoMe staff member will serve as your instructor, guiding your group through the activity. Learn basic safety, form, and then fire away! This timeless camp activity is great for adults and kids alike.